Craig Miner, "Border Frontier: The Missouri River, Fort Scott & Gulf Railroad in the Cherokee Neutral Lands, 1868-1870," p. 105. Douglas C. Jones, "Medicine Lodge Revisited," p. 130. Betty Littleton, ed., "Touring the Southeast Kansas Area in 1896: From the Diary of Thomas Butcher," p. 143. John L. Madden, "The Financing of a New Territory: The Kansas Territorial Tax Structure, 1854-1861," p. 155. James C. Malin, "Notes on the Poetic Debts of Eugene F. Ware- -Ironquill," p. 165. Bypaths of Kansas History, p. 211. Kansas History as Published in the Press, p. 214. Kansas Historical Notes, p. 218. 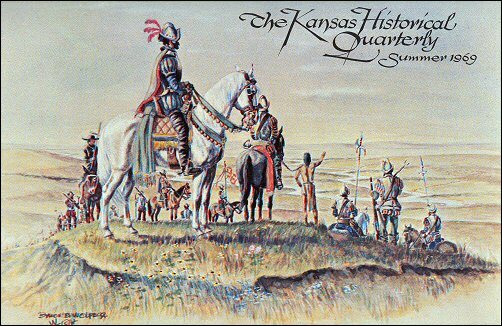 A watercolor depicting Coronado and his 30 men as they arrived in Quivira (present central Kansas) in 1541. The party was guided by an Indian called the Turk who describe Quivira as a land f gold. When the vision failed to materialize the disappointed Spaniards garrotted the guide. The watercolor was painted by Byron B. Wolfe in July, 1968, and is reproduced here with his permission. Wolfe, who lives in Leawood, Kan., is a recognized painter of authentic Western Americana.